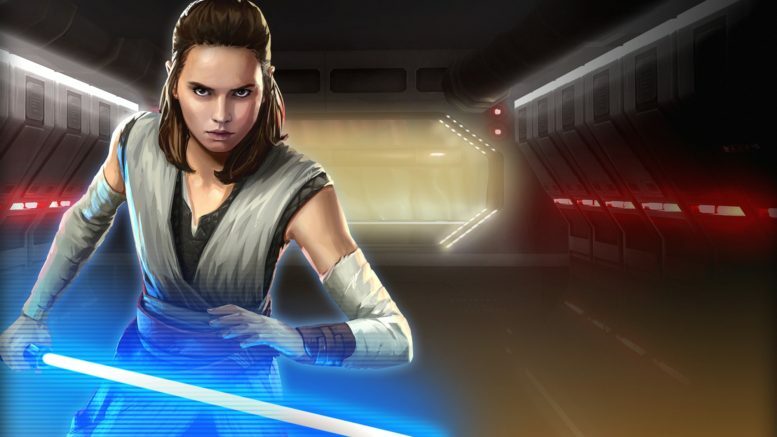 Rey (Jedi Training)’s special event Rey’s Hero’s Journey has returned to SWGoH and Gaming-fans.com has created a new guide specifically to aid those seeking one of the most valued characters in the game. Rey (Jedi Training) arrived two years ago after much speculation and her kit has been well-established as a necessity on any roster ever since. From use in Arena to Territory Battles, TerritoryWars, Grand Arena, and across multiple raids, Rey (Jedi Training) brings unique value to the game. The event Rey’s Hero’s Journey requires specific characters and gear, so take a look at our SWGoH 101 article, Completing Rey’s Hero’s Journey Event for details on how to prepare for the event as well as strategies for completing each Phase. Whether you’re acquiring Rey (Jedi Training) for the first time this round or are still preparing to get her in future event appearances, be sure to review our Sith Triumvirate Raid Guide, as Rey (Jedi Training) and her accompanying team are key to success in one of the most difficult raids to date. Also, review Best Mods for Rey (Jedi Training) to make sure that your Hero’s Journey character is at her best on your roster. Be the first to comment on "Rey’s Hero’s Journey: New Guides and Tips!"